Ten thousand years ago receding glaciers sculpted the final product of their existence, leaving a series of streams that are both fascinating to ponder and paddle. 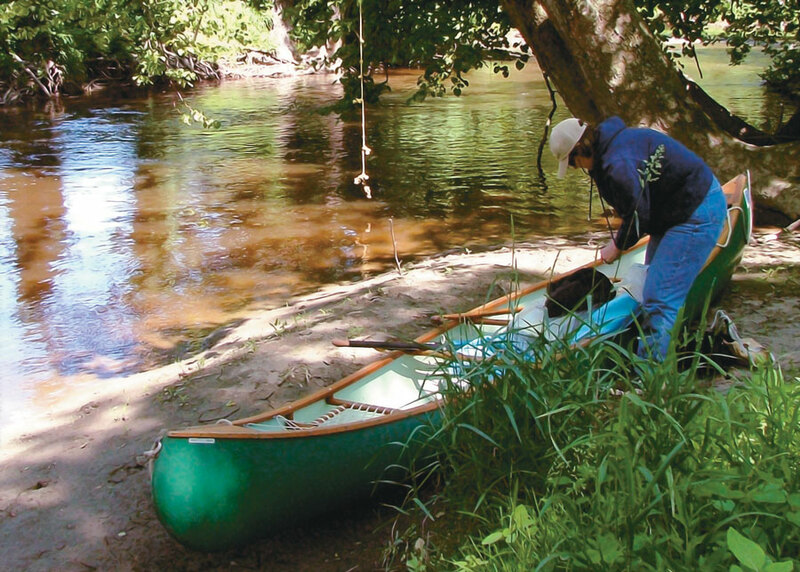 The ice age created the heart of Sussex County's Vernon Township, a vast river bottomland that collects water from the surrounding mountains in a network of creeks and wetlands that make for a classic canoeing adventure on Wawayanda and Pochuck Creeks. The valleys formed by these rivers are abundant with scenery and wildlife. Trout rise for insects. A huge snapping turtle startles from its nap on a pile of flood debris high on the riverbank and dives five feet, disappearing in the rust brown water. A beaver pops up and dives under a snag. Muskrat, frogs, Canada geese, mallards, raccoons, bufflehead ducks, gray herons, and even great blue herons are common. On sunny days deer sleep in the high grass on the banks, using the water at their backs as safety from predators. Black bear occasionally wander the swamps. 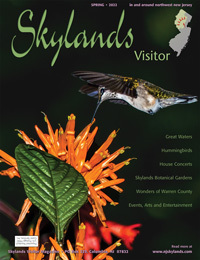 But sights are not the only lure of this Skylands paddle. Perhaps the most advantageous outcome of nature's work in the Warwick/Vernon valley is ease of access. Although there are a variety of possible launch points from which a valley tour can begin, a complete loop roughly copies the shape of a horseshoe. This means that instead of driving a long straight line down river to place a pick-up vehicle, you simply drive across the horseshoe. It is a canoeist's dream; short drive for a long paddle. 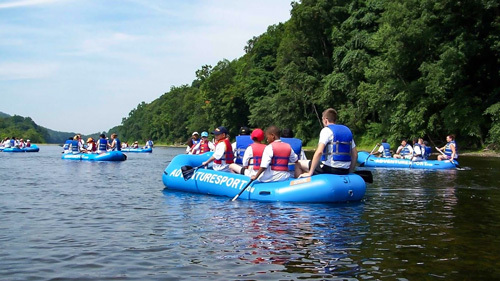 Even with the topographic map that covers the area (US Geological Survey ­ Wawayanda Quadrangle, New Jersey-New York) deciphering all the creeks that make up this boomerang canoe tour can seem daunting. The simple explanation is this: Put into Wawayanda Creek just off Rte 94 on Jockey Hollow Road at the bridge in New Milford, New York. Take out from the Pochuck Creek at the bridge on Newport Bridge Road in Pine Island, New York. To connect the horseshoe with the shuttle vehicles, take Jockey Hollow Road west, to Ryerson Road west, to Blooms Corner Road north, to Newport Bridge Road west. 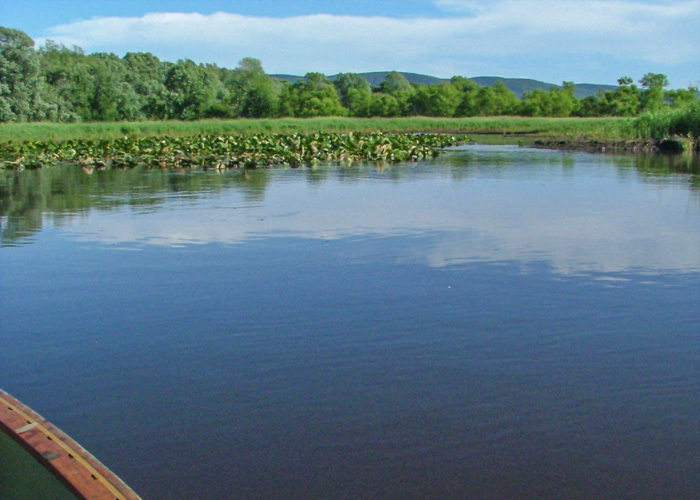 While ninety-five percent of your paddling will be on the New Jersey side of the border, your automobile shuttle trip will never leave New York State. The road trip is about five minutes. The canoe trip is four to six hours. On most river trips your boat will travel steadily down river in one direction. So the light and even the views can have sameness about them. The Wawayanda - Pochuck Creek adventure has the advantage of a 180-degree direction change. As the views change down river so does the angle of the sun's light on the water. This may seem a small thing in theory, but experiencing it is immensely satisfying. The put in at Wawayanda Creek on Jockey Hollow Road is just a few yards below a feeder creek that adds flow via extensive drainage from Wawayanda Mountain. A few yards below, a larger creek, the outflow from Wawayanda Lake and drainage from Wawayanda State Park's great laurel bogs, doubles the volume of the river. Wawayanda Creek's New York arm flows from over ten miles up Wawayanda Mountain's northern shoulder along Rte 17A in Warwick. This varied drainage so close to the creek's sources means the water levels change rapidly in response to rainfall. Stream level fluctuations of six inches to two feet are possible within a few days. These water level changes cause bank erosion which, together with high winds, have caused numerous trees to fall into and across the river. Canoeists call these strainers or snags. Some of them can be negotiated on the water; others must be portaged. Boaters should be aware that paddling under or around snags could be dangerous, especially when the river is flowing strongly. Over the years area paddlers have made attempts to clear the river using chainsaws to cut away snags. This time consuming and difficult work has not been done recently. 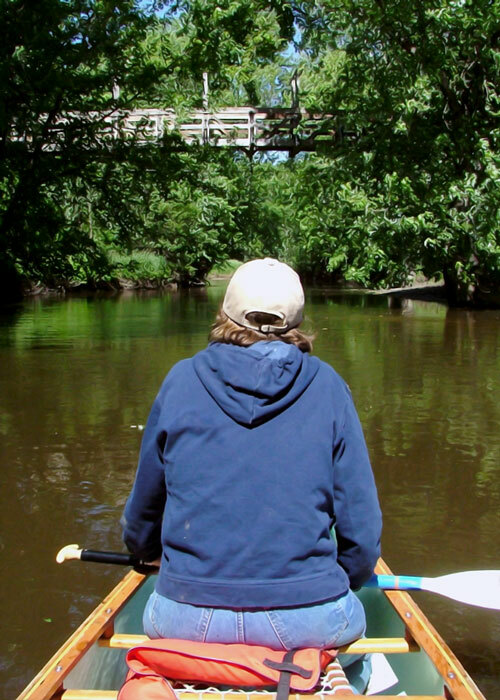 A May 2004 paddle on this section of the river showed 30 ­ 40 snags in place, so paddlers should be prepared to portage around obstacles. While the river is not ideal for novice paddlers, knowledgeable intermediate boaters should fare well. The first leg of the journey downstream is a snake-like series of turns as where creek gropes its way along the side of Wawayanda Mountain's "wall." Here the mountain rises almost straight up alongside the stream, a railroad line and Rte 94. The one-thousand foot rise shades the river from the morning sun and makes for some great views of the cliffs above. The river meanders along active horse and dairy farms, also transecting fallow farmlands newly acquired by Wawayanda State Park. The river is trout-stocked in both New York State and New Jersey, so spring weekends sprout fishing aficionados on the banks. Wawayanda Creek has some brisk sections, little riffles and even two or three splashes of whitewater. These are interspersed with railroad trestles, road bridges and a steel footbridge for the Appalachian Trail. Be on the lookout for a chain and two cables stretched across the river by farmers in attempt to keep their livestock from escaping up or downstream. 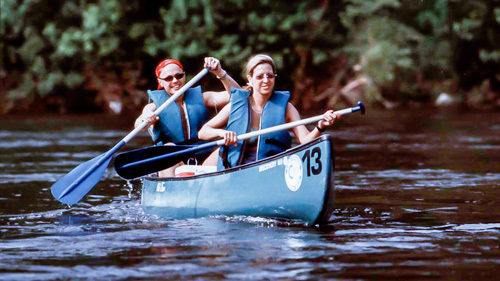 A combination of scenery, river kinks and obstacles keep the Wawayanda Creek section of the paddle exciting. Just beyond the Appalachian Trail steel footbridge, the river comes to its confluence with the Black Creek. This drainage flows from Hamburg Mountain in the southern end of the valley, adds water to the flow and marks a direction and name change for the river. Here, paddlers bear right to continue the journey on the Pochuck Creek. The stream takes on the feel of a southern bayou with low hanging willows to mimic Spanish moss and others reminiscent of Cypress. Grass covered muddy banks replace rock and sand as the river winds through forested wetlands. As the Pochuck turns ever northward the sun shifts to paddlers' backs. Slowly the forested bayou-feel of the river gives way to open grasslands. The ever-present wall to the paddlers' left on Wawayanda Creek is now in the distant rear. A feeling of closeness melts into sweeping vistas of the mountains that surround the drainage. These mountains are for the most part under State or Federal stewardship. So to the eye, evidence of human population is minimized to almost none. On a recent paddle a well-traveled friend remarked that had she felt as if she had traveled to some exotic outdoor adventure destination in the west, rather than just a few miles from home. Time spent in this glacial valley does that. Perhaps it comes from traveling the last rivulets of water that flow where vast glaciers once melted to form first an inland sea and then this flow. It is a place where flocks of migrating birds and herds of deer ran thick enough to make the banks of this river a home to Leni-Lenapi Indians and perhaps even others before. Somehow, negotiating the vagaries of the river and its snags, smelling the water, the grass and the mud, watching the valley reveal itself as if by accident, combine in alchemy. This primal magic communicates the ancient past and wildness of this place, hidden from the rural bedroom neighborhoods just beyond. Even after a languorous journey of six hours, the end comes too soon. A large wetland unfolds on the right, a product of the river's backflow during flood periods. In the spring and fall this floodplain is filled with migratory birds that, once disturbed, can take off in flocks numbering into the hundreds, raising a cacophony that speaks to the seasons. And then, a turn to the right past a dairy farm, a riffle over a gravel bank and the takeout point, Newport Bridge, presents itself. From here it is possible to continue into New York State, following the Pochuck through Pine Island (there is a handy takeout at the bridge on Route 1) and onward to it's eventual confluence with the Walkill River. Although the morning's start point is just five minutes away by car, this water will flow 100 miles to its journey's end, north to the Hudson River and then south again to the sea. For many river adventurers it is enough to have paddled these creeks and this Skylands valley at the source of the flow.